"FLINT'S BACK In Action... In Danger... In the Virgin Islands... Where the Bad Guys... Are Girls!" 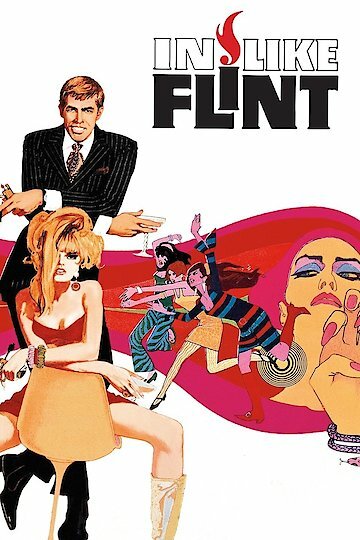 The 1967 sequel of the parody spy film Our Man Flint (1966), In Like Flint was directed by Gordon Douglas in 1967. It is about a conspiracy to depose the ruling American patriarchy with a feminist matriarchy. These militant feminist decide to kidnap and replace the U.S. President. They intend to discredit the head of the intelligence agency and takeover a space platform that has nuclear warheads. They coordinate this world takeover from a female beauty farm in the Caribbean called Fabulous Face. This brings secret agent Derek Flint out of retirement to help his former superiors, and thwart the evil conspiracy. The Fabulous Face organization replaced a sitting American president by gassing him at a golf course, as he was golfing with Flint’s ex-boss. After gassing the president, they replace him with a look alike. The Fabulous Face organization was ran by Elisabeth (Anna Lee) and the first step in their plan is to gain control of a US space facility in the Virgin Islands. Because the presidential golfing party was gassed, they had no knowledge of what took place, but the spy chief noticed a three-minute discrepancy, and this caused him to seek help from his best-retired agent, Flint. In Like Flint is currently available to watch and stream, buy on demand at Amazon, Vudu, Google Play, iTunes, YouTube VOD online.